LEWISVILLE, Texas, November 1, 2017 – The world's first privately owned animal airport and handling center showcases a high-performance, energy-efficient insulated metal panel (IMP) building envelope. The Ark at New York City's John F. Kennedy (JFK) International Airport sets the standard in world-class, luxury accommodations — for animals. The 178,000-square-foot airside cargo terminal will change the way passengers and corporations transport pets and livestock, particularly dogs, cats, horses, cattle and birds. The $48 million facility houses nearly 50 horse stalls, a cattle pen, a veterinary clinic and spa-like facilities to pamper household pets. Designing interior spaces for animals presented a unique set of challenges to the architectural design team at Gensler of New York. 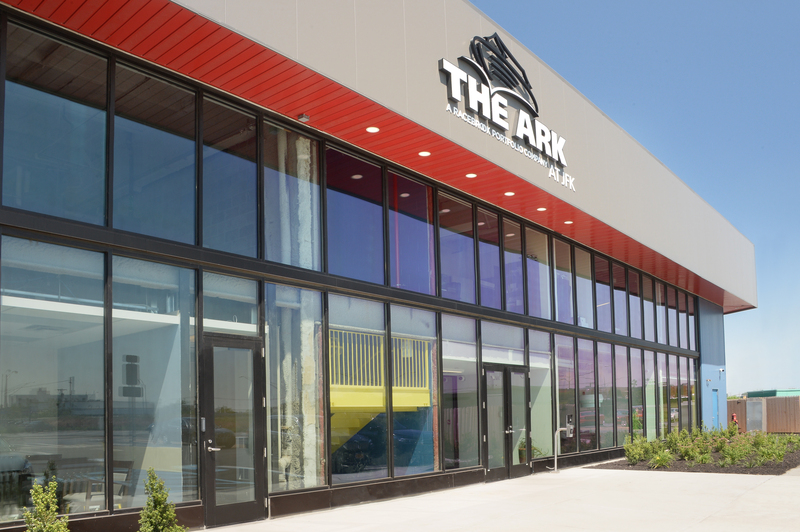 The Ark pet center feature grooming stations and spaces tailored to the recreation of each species, such as splash pools for dogs and climbing trees for cats. Livestock, however, need a cycle of fresh air constantly, placing an emphasis on adequate ventilation and environmental control. "Gensler is accustomed to designing airports with an eye to fostering wellbeing for people," says Gensler Senior Associate, Cliff Bollmann, director of aviation and transportation. "The Ark at JFK posed a unique design challenge for us: to create a place that could ease and simplify the sometimes complex process of transporting animals by plane." The Ark replaces a smaller kennel and quarantine facility called VetPort, which suffered from a poor location at JFK International Airport some distance away from the heavily traveled terminals. A veteran designer of airports, Bollmann and his team from Gensler targeted an abandoned cargo facility that offered both a convenient location and adequate space. "The building was to be converted approximately 40 percent into an animal handling operation, with the balance returned to freight transfer," says Secretary/Treasurer Bruce Forster of installer Stuart Berger Construction Corp. While the architectural team initially hoped to repair the existing cladding to make it watertight and improve insulation, Forster "introduced an insulated metal panel solution as a time and cost saver." His suggestion was to reskin the vacant hangar with a Metl-Span insulated metal panel (IMP) wall system. "Gensler specified leaving the existing interlocking panel system by adjusting, repairing and adding similar panels to suit the new layout — then adding an elaborate insulation, framing and interior finish to meet energy and fire codes," Forster notes. 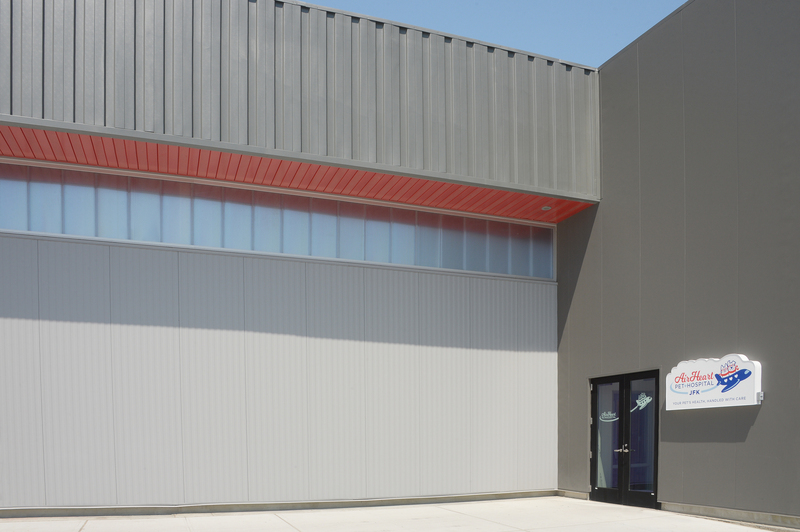 Insulated metal wall panels rely on a high-performance foam core injected between pre-finished steel faces for exceptional thermal efficiency and all-weather control. Available in multiple thicknesses as well as horizontal and vertical orientations, Metl-Span IMPs provide the industry’s most high-performance technology in a single component. Conventional, multi-component building envelopes address the critical weather barriers with multiple product sources and complex installation steps. 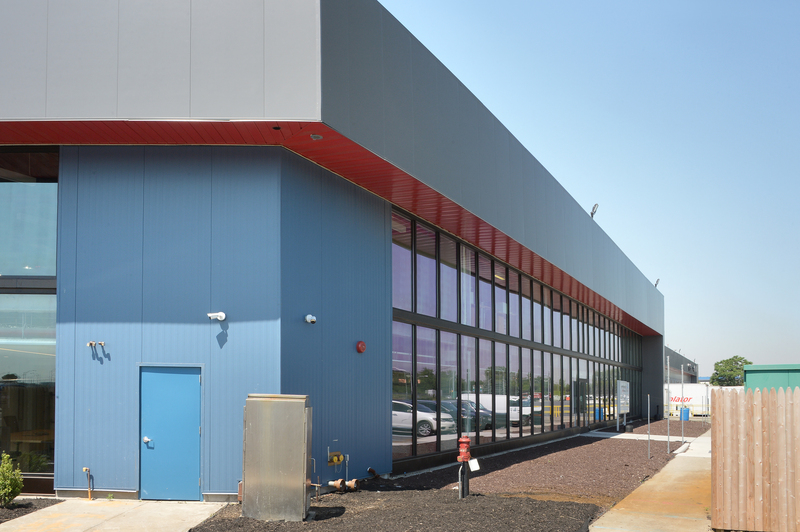 The Ark at JFK showcases nearly 14,000 square feet of Metl-Span CF insulated metal wall panels in three distinct profiles: Architectural Flat, Light Mesa and Mesa. The juxtaposition of flat and lightly corrugated exterior panels lends the project a modern, sleek aesthetic that perfectly suits the facility's end-use: an amalgam of healthcare, hospitality and transportation. "The Ark concept, I believe, is more sanctuary than ship," Forster adds. Designers incorporated both 2- and 4-inch panel thicknesses for optimal thermal performance in the airside cargo terminal. The exterior of the high-performance building envelope blends Pacific Blue with Tundra and Charcoal Gray hues. One of the benefits of the panel's single-component construction is a finished interior liner. The interior panels, painted in Metl-Span's standard Igloo White, are exposed throughout much of the facility, providing a clean, contemporary appearance. "In this project, the interior liner, high insulation factor and speed of installation were all favorable attributes of the IMP solution," Forster says. "The fact that the new panels are a high-performance finish and look great is a bonus. The system also saved money." The Ark at JFK also utilizes 5,679 square feet of Metl-Span's 7-inch ThermalSafe insulated metal wall panels, featuring a non-combustible mineral wool core. The panels achieve a three-hour fire resistance rating, helping the design team meet today's stringent fire codes and bring the 60-year-old cargo facility into the 21st century. Of course, ThermalSafe mineral wool panels combine fire-resistance with the thermal and moisture performance expected from Metl-Span IMPs. Since its grand opening in early 2017, the Ark at JFK International Airport has accommodated travelling animals of all shapes and sizes. Open 24 hours a day, seven days a week, the facility is the first of its kind, and is quickly revolutionizing the process of pet travel.